A Kotobukiya Japanese Import! A PREVIEWS Exclusive! X-Force cannot be stopped, and one of its most infamous members is back and looking great! Now that the Avengers lineup is complete, Kotobukiya expands its Marvel ARTFX+ line to other mainstream Marvel Comics characters. First up is one of the most popular comic book superheroes in the business in his mutant black ops team costume, Deadpool X-Force! Formerly a member of the Weapon X program, the ''Merc with a Mouth'' is a longtime assassin for hire and independent agent who's worked alongside just about every superhero and villain from the Avengers to X-Men and everything in between. Now the fourth wall-breaker invades your house with two fantastic new ARTFX+ statues including this one capturing his dark X-Force look! Created in 1991 by Fabian Nicieza and Rob Liefeld, Deadpool has never looked back and continues to appear in more and more books with his unique style and nonstop witty repartee, not to mention his trademark costume and extensive armory! Wilson makes a stunning debut in the ARTFX+ series as he crouches in preparation for the attack, drawing one of his swords from the sheaths on his back. This time Deadpool ditches his iconic red and black costume for the black and gray X-Force variant that still features the same abundance of straps, pouches, extra ammunition, spare weapons, pointy hood with mask, and of course his cute Deadpool logo belt buckle. In his low crouch the assassin leans forward with his other hand extended in front of him, and you can choose between interchangeable left hands that either give a thumbs up or wield a second sword! 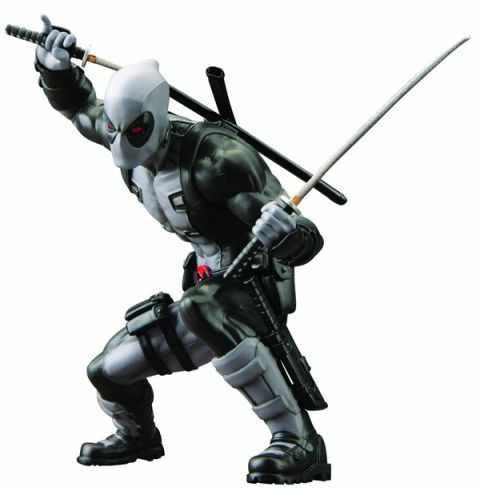 Sculpted by Junnosuke Abe, the same master craftsman behind the Marvel Now Avengers series, X-Force member Deadpool stands 6 inches tall (1/10th scale) in his deep crouch with perfect stability on his included magnetic display base. Deadpool is of course awesome all on his own, but he also works great with teams and looks fantastic alongside the Avengers and other upcoming Marvel ARTFX+ statues from Kotobukiya!